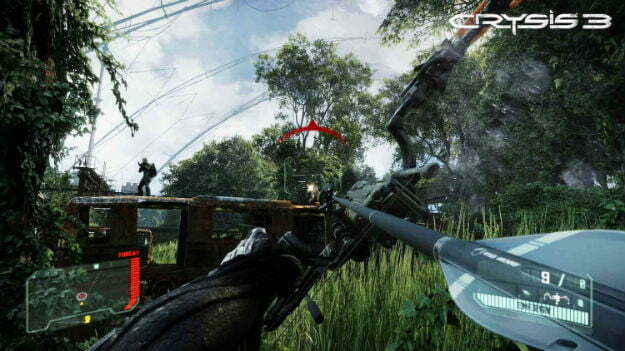 Crytek is working on Nintendo’s Wii U, that much is known, but it appears that its upcoming sequel in the Crysis series will definitively not be its first game for the console. Amongst the unusually rich spring crop of new games coming out over the first six months of 2013, one of the most promising looking sequels is Crytek’s Crysis 3. Crytek is known for pushing technology to its limits, and the German studio claims that Crysis 3 will be the game that rings the very last bits of power out of the Xbox 360 and the PlayStation 3 as those consoles enter what’s believed to be their last year on shelves. “Crysis 3 is absolutely maxing out the consoles,” said Crytek CEO Cevat Yerli in December, “There is absolutely not even 1 percent left.” That would make it an ideal game to put on Nintendo’s Wii U, a console still in its infancy that’s been accused of not being up to par with Microsoft and Sony’s seven-year-old machines. Despite rumors to the contrary, though, Crysis 3 isn’t coming to Wii U.
It’s unusual that EA wouldn’t want one of its marquee 2013 releases on Nintendo’s console, especially considering that it’s been so willing to support the Wii U with ports of its Xbox 360 and PlayStation 3 titles to date. Mass Effect 3, FIFA 13, and Madden NFL 13 all appeared on Wii U in time for the console’s release. EA is also releasing a port of Need For Speed: Most Wanted in March. The decision does reveal a pattern in EA’s early Wii U publishing pattern: The company seems reticent to release its more violent Mature-rated titles on the console. While Mass Effect 3 is rated Mature by the ESRB, it’s not as graphically violent as EA’s other console titles coming in 2013 that are skipping Wii U. Dead Space 3, Army of Two: The Devil’s Cartel, and Crysis 3 all share graphic violence in common in addition to not getting a Wii U edition.